OXFORD, Miss. – Students and faculty from the University of Mississippi’s Department of Nutrition and Hospitality Management were recognized for more award-winning abstracts than any other university participating in the recent 2017 Food & Nutrition Conference & Expo in Chicago. With more than 12,000 participants registered for the Oct. 21-24 event, FNCE featured more than 130 nutrition science research and educational presentations, lectures, panel discussions and culinary demonstrations. NHM faculty and students presented 15 abstracts, with five receiving outstanding abstract awards, on topics ranging from sustainability to food insecurity and nutrition perception. 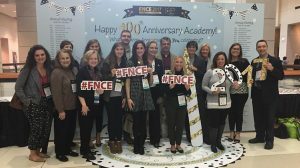 “The Academy of Nutrition and Dietetics celebrated 100 years as a professional organization for registered dietitians at the FNCE conference,” said Mary Roseman, professor of nutrition and hospitality management. Graduate students Kelsey Dismukes, Michelle Weber and Sydney Antolini, along with professor David H. Holben, were recognized for their abstract, “Food insecurity and physical and mental health of elementary school children in a rural, Appalachian Mississippi community.” Funding for the study came from the UM Foundation’s Nutrition Security Support Fund, made possible with donations from Monsanto. The group’s abstract poster was among only three selected to be part of the conference poster tour, where Halfacre provided a 10-minute overview and brief question-and-answer session. Graduate student Claire Adams and faculty collaborators Roseman and Cindy Choi were recognized for their abstract, “The Impact of Customers’ Perception of Nutrition-Related Components on McDonald’s Users’ Visit Frequency,” and graduate student Chelsea Bell was recognized for her abstract, “Statewide Recipe and Meal Planning Guide: A Child Nutrition Director’s Resource,” with faculty collaborators Laurel Lambert, Teresa Carithers and Chang. “Their accomplishments show the national presence and diverse scope of our NHM teacher-scholars. They are truly preparing the future leaders in the field of nutrition and dietetics,” said Carithers, interim dean of the School of Applied Sciences. For more information about the Department of Nutrition and Hospitality Management, visit http://nhm.olemiss.edu/.